If you've never heard the term "rewilding," then you need to get busy. Google is your friend. Photo courtesy of "Images for Light Grey Wolves." http://imgkid.com/light-grey-wolves.shtml Excitedly, we researched and determined that this animal was either a Mexican lobo or a grey wolf, which is unlikely if one bases a decision on propaganda put out by government agencies and their sources. The author, Steve Busch, appears to be knowledgeable and credible and awake. He also makes excellent arguments as to how the nefarious globalists are moving forward with their plan to "rewild" the globe, introducing predator species that have taken centuries to control. His compelling arguments have moved me from an admirer of the wolf to and admirer who is now aware of the danger posed to our food sources that live on hooves - as well as to ourselves. Rural America has awakened to find an enormous green dragon camped out on its doorstep. Some tried to shoo the beast away and bolt the door, but they found a huge hairy paw blocking the doorway. When folks realized the beast wouldn’t go away, they tried to make peace with him, work out a compromise, establish some sort of agreement. When they turned to go back inside the house they were shocked to discover the creature sitting at the dinner table demanding to be fed. Let’s look at one example where the green dragon is currently taking over our living space. The United States Fish and Wildlife Service (USFWS) has followed a regional approach in listing the Grey Wolf as an “endangered species” despite the lack of evidence or data suggesting that wolves were ever endangered. In fact, just the opposite is true. 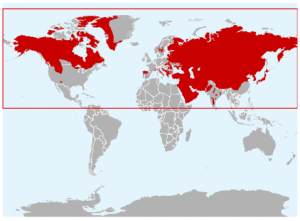 The IUCN Grey Wolf Range map lists the wolf population as “STABLE”. However the IUCN’s population assessment is scientifically inaccurate since all the available data shows wolf numbers rapidly increasing all across the Northern Hemisphere. The IUCN fails to include data that shows wolves have successfully re-colonized most of Europe- including Germany, Switzerland, France, and Spain. There are approximately 2,000 wolves in Italy alone. Estimates of the total global population of wolves vary widely depending on who’s doing the counting. But even by using the most conservative measures it is estimated that today there are between 250,000 and one million wolves roaming the northern hemisphere. Wolves in the United States are receiving special protections not because they are endangered, but because they are the “keystone” species driving the REWILDING agenda. The Defenders of Wildlife map to the left shows grey wolf core recovery areas and historic grey wolf range covering most of North America. 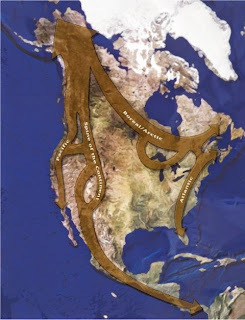 The map below was developed by the Rewilding Institute and shows “mega-linkages” for large “keystone” predators. These low resolution images are used for discussion purposes only in order to reveal the radical environmental agenda behind wolf re-colonization. Establishing wolves as a protected and privileged predator near areas of human settlement not only decimates our ungulate populations and invites livestock depredation, but it also locks up our natural resource base. Unchecked wolf expansion into all areas where they were previously extirpated will impoverish our citizens, destroy our rural economies, undermine our private property rights, and create a potential pandemic of wolf spread diseases. Wolf re-colonization will quickly lead to price hikes and a drastic reduction in the available food supply. As wolves continue to spread unhindered, their presence will likely lead to the confiscation of firearms as rural citizens attempt to take matters into their own hands in a last ditch effort to protect life and property. 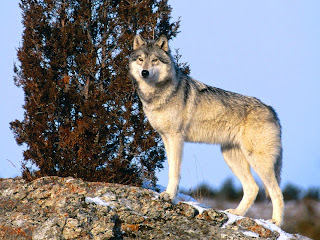 On Oct. 3, 2012, the California Department of Fish and Game listed wolves as a fully protected species in that state. This decision was made because one radio-collared wolf happened to wander into Northern California from an established pack in Oregon. Wolves in Washington and Oregon are also currently listed as a fully protected species. But where did these wolves come from? Washington State’s wolves came from British Columbia, Idaho, and Montana. Montana’s wolves came from Canada, Idaho, and Wyoming. Oregon’s wolves came from Idaho, while Wyoming and Idaho got their wolves from Canada. And Canada still has more of the creatures than they know what to do with. But regardless of where the wolves originated, Californians are now obligated to create their own wolf recovery plan just like their unfortunate neighbors. We need to see the bigger picture here. The greens claim that allowing the “DE-LISTING” of wolves on a regional or state by state basis was illegal and violates provisions of the Endangered Species Act. We must counter by AGREEING with the greens that listing wolves as an endangered species on a state by state basis is not only unsupported by the ESA, it is not supported by SCIENCE! We must demonstrate that wolves are NOT ENDANGERED using any scientific measure and certainly do not require special privileges or protections to succeed as a species. This current lawsuit must be thrown out and the bigger picture exposed. This will put the ESA back where it belongs and stop REWILDING in it’s tracks. The radical environmentalists have followed an authoritarian top down strategy in order to impose their agenda on the rest of humanity. Successful resistance requires a bottom up approach. Fortunately, this is exactly what is happening. People are waking up and alerting others to the dangers of the radical environmental agenda. Responsible citizens are establishing networks, sharing information, and taking a stand against a common enemy. The ground swell of Americans who have become actively engaged in resisting the green dragon is spreading like a brush fire. Armed with facts, these folks are preparing for the battle ahead. We need to be wise as serpents and harmless as doves because the stakes are incredibly high. We cannot afford to underestimate the strength of the enemy or make tactical mistakes. This land is certainly worth fighting for, but if we really want to show that we care for this country, and that we really do love our neighbors, we’d better get busy. Even though solve populations have increased across some parts of Europe, they are far behind the historical range of Wolf populations. Also, our political elite are sold our to big corporations that destroy the environment all for economic gain. There is no government conspiracy to rewild the planet because they would go against the corporate agenda.